CAMP: "A cornucopia of frivolity, incongruity, theatricality, and humour." "A deadly, winking, sniggering, snuggling, chromium-plated, scent-impregnated, luminous, quivering, giggling, fruit-flavored, mincing, ice-covered heap of mother love." "The lie that tells the truth." "Ostentatious, exaggerated, affected, theatrical; effeminate or homosexual; pertaining to or characteristic of homosexuals." "At my age, you can say exactly what you bloody well think." She was once invited by a magazine editor to a lunch where Nicholas Soames praised Virginia Bottomley as being “one of the chaps” in parliament. The editor found this offensive and said that a woman cannot be a chap. Trumpers took the fag out of her mouth, put down her gin and simply said: "Balls!" 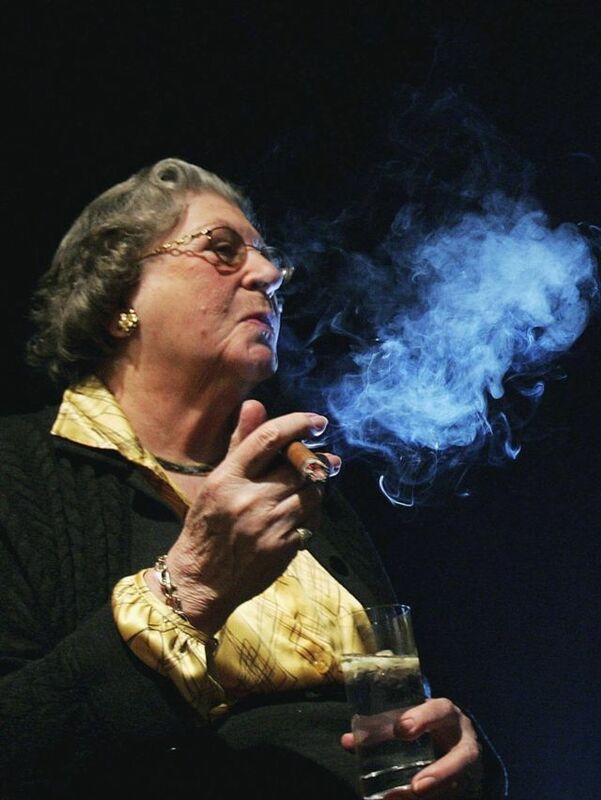 The world has lost another great raconteur, one of the last remaining masters of political repartee and old-school no-nonsense forthrightness - the redoubtable Baroness Trumpington, veteran of society balls and of code-breaking at Bletchley Park during WW2 alike, who has died aged 96. We're talking of a woman who dodged the groping hands of David Lloyd-George, was a secretary to Churchill's friend and colleague Duff Cooper, became a renowned New York socialite, married a man who became a master of Eton College, entertained members of the Royal Family and partied with the Astors, and (remarkably) sparred with, yet remained a trusted ally of, Margaret Thatcher; and was a stalwart member of the Lords and Commons Pipe and Cigar Smokers' Club. Phew! And what better way to remember the lady, who is perhaps most remembered for her "two-fingered salute" to a fellow peer, than with a few extracts from her autobiography (a book she later claimed she "never read")? ...[In the House of Lords] Lord King of Bridgwater commented that those people who had served in the Second World War were starting to look ‘pretty old’, it was a natural reaction to stick two fingers up at him. I had thought it was between him and me, but the camera was on me, so it was between him, me and everyone who had a television. At first I tried to say I had just been primping my hair but it was perfectly obvious what I was doing so I had to admit it. RIP Jean Alys Barker, Baroness Trumpington DCVO PC (née Campbell-Harris, 23rd October 1922 – 26th November 2018). We'll never see her like again.